Do you like orange? 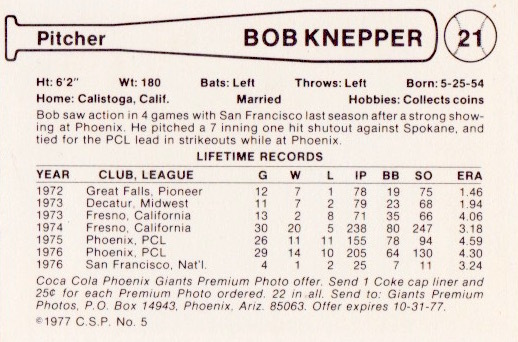 Here's future big leaguer Bob Knepper, modeling a Dutch-orange hat against orange trim and orange borders. His card background shows a Southwestern staple, well-watered grass that ends at a fence line. This hints at an interesting question: do water costs pinch the ability of desert teams to compete with those in temperate cities? Water issues didn't slow Phoenix in 1977, who finished with the PCL's best record, if by foggy statistical means. On one hand, the Giants' 732 BB and .382 OBP led the league. On the other, second place Salt Lake City (150) more than doubled Phoenix's league-worst homer total (67). Despite posting also-ran ratings in both hitting (.796 OPS) and pitching (6.02 runs/game), Phoenix overachieved with a .579 winning %, perhaps due to superlative work by manager Rocky Bridges. Teams who get on base but can't hit homers usually blame the ballpark. Phoenix's 345-410-345 dimensions back that up, as do their league-leading triples (84), where long flies bounced off walls instead of over them. Bridges could've adapted his team's performance for the surroundings, working free bases where he couldn't expect big flies and turning them into enough runs to win more games than the average roster, but that remains speculative until we can enjoy fuller season-by-season histories for teams like the AAA Giants. 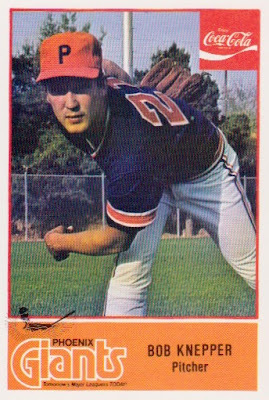 The MLB version of Knepper went on to become Houston's top lefty, winning 93 games as an Astro (1981-89) and garnering two All-Star selections. He also sparked 1988 controversy with a Sports Illustrated interview that criticized one of pro baseball's few female umpires, earning blowback of his own. Beyond those particular comments, S.I. 's piece dives deeper into the flip sides of loneliness and family, something all traveling athletes must deal with. It's worth a read for its "pre-Internet-ness," compared to today's always-on, media-aware careers. Value: This #5 cost $2 at the 2015 National, unburied from stacks of fellow minor leaguers. 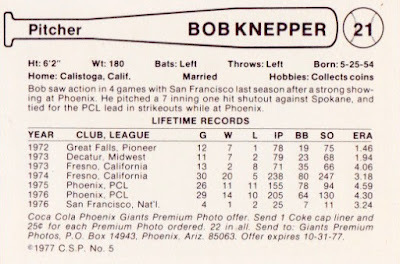 Fakes / reprints: I doubt you'd make money reprinting minor leaguers like Knepper, but future HOFers from similar sets could be replicated, given its thin stock and today's scanning technology. If you have the means, stick to established dealers for top "pre-rookie" minor league type cards.